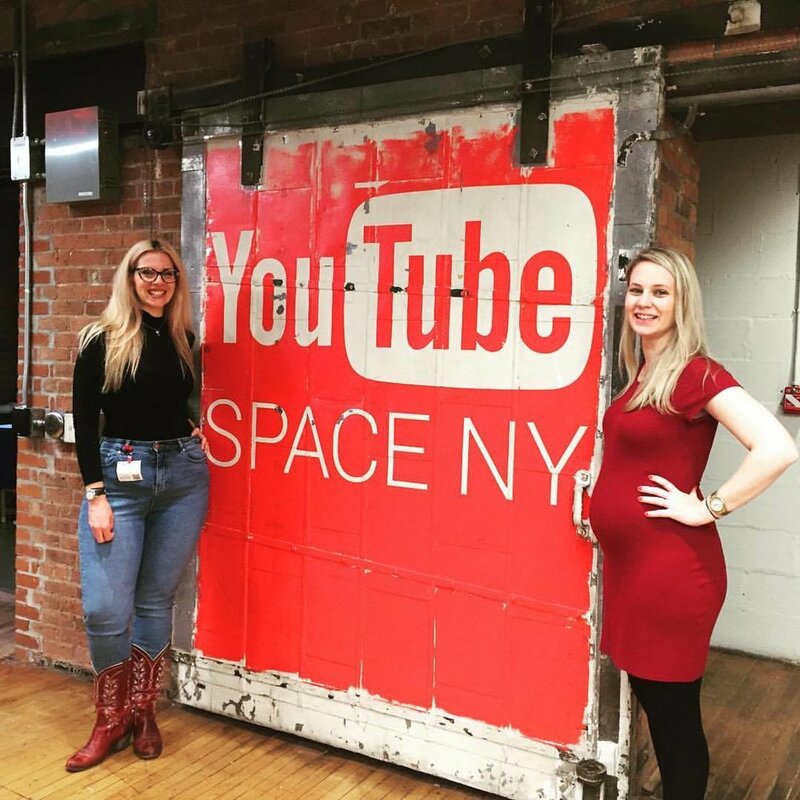 OCTOBER 2017: KM & Meg had a great time teaching a Women in Comedy Workshop at Youtube Space for putting the YOU in youtube. SEPTEMBER 16th 2017: KM will be moderating a Q & A with director Gillian Robespierre following a screening of her newest film, Landline staring Jenny Slate. The event is free at SVA Theater. Further details here. SEPTEMBER 11th 2017: KM is moderating a Q&A with legendary artist and hoax master Joey Skaggs after a free screening of the documentary Art of the Prank - the Movie, Monday 9/11 7pm at SVA Theatre. Come along. JULY 2017: KM's A Short Film to Satisfy The Bechdel Test, is up on Funny or Die. FEB 2017: And that's a wrap on The Great American Drama. Thanks to all those who came out to watch, review and contribute. OCTOBER 2016: KM in Freedom, U.S.A.
Synopsis: A short reflection on inter-connectivity, existentialism and... five household ants. JULY 2016: 401 UCB Improv class show. JUNE 2016: KM's first short for She Said Productions, The Five Ants that Live in My Apartment has been selected to be screened at Chain Film Festival, East Village this August. MARCH 2016: KM will be in the benefits show Too Many Ladies Smash the Patriarchy on March 25th and 26th. Click on the pic below to pre-book tickets and hurry, they're selling fast. DECEMBER 2015: Katy-May was lucky to be part of the Confetti Project for individual and group portraits with the NYNF ensemble. For more info check out their website. JULY 2015: CLICK HERE FOR AN ARTICLE KM WROTE FOR QUIET MIKE. JULY 2015: Here is a short KM made for TOO MUCH LIGHT MAKES THE BABY GO BLIND's July 4th weekend, touching on violence in film. APRIL 2015: KM PRODUCED, WROTE AND DIRECTED THIS TEST SHOOT FOR A PILOT SHE WROTE. JANUARY 2015: KM IS HUGELY EXCITED TO START WORK ON, HUNNY-BUN AND BABY DOLL BY AUSTRALIAN PLAYWRIGHT LOURIS VAN DE GEER. PERFORMANCE, JANUARY 30TH @ DIXON PLACE. TIX HERE. DECEMBER 2014: 2014 SHOWREEL IS HERE JUST IN TIME FOR 2015. NOVEMBER 2014: PEEP HAS ARRIVED AND KM FILMED THIS COMMERCIAL FOR THEM A FEW MONTHS BACK. HERE IT IS! NOVEMBER 2014: KM WILL BE PERFORMING WITH THE NYNF (AND WITH A "SPECIAL APPEARANCE" BY STEPHEN COLBERT) ON THE 17th OF NOVEMBER AT THE BOWERY HOTEL. NOVEMBER 2014: KM WAS A RUNNER UP FOR THE AUSTRALIAN COMMUNITY CHALLENGE FOR HER PIECE "RACK OFF OR WHAT'S WHO'S HOME?" SEPTEMBER 2014: ON THE SET OF NEW SHOW, MY CRAZY LOVE (COMING TO OXYGEN IN NOVEMBER), KM PLAYS, ANNIE A KOOKY JERSEY GIRL WITH LOADS OF BAD LOVE UPDATES FOR HER BEST FRIEND. JULY 2014: THAT'S A WRAP! THE UNNATURAL REALITY TEAM HAS FINISHED FILMING THEIR SHORT FILM FOR RELEASE IN SEPTEMBER 2014. JUNE 2014: KATY-MAY HAD THE PRIVILEGE OF MARCHING ALONG SIDE THE NY NEO FUTURIST IN THE 2014 PRIDE PARADE. WITH ABOUT 2.5 MILLION PEOPLE IN ATTENDANCE IT WAS A MOMENTOUS EVENT FILLED WITH LOVE, OPENNESS AND OF COURSE, PRIDE. IT WAS A FLAWLESS EXAMPLE OF HUMANISM AND RESPECT, WHICH KM WAS HONOURED TO BE A PART OF. JUNE 2014: KM HAS STARTED FILMING A PROJECT SHE HAS BEEN WRITING FOR THE LAST FEW MONTHS. BELOW IS A SNEAK PEEK WITH COLLABORATORS AND FELLOW ACTORS VANNA PILGRIM AND PHOEBE DWIGHT. MAY 2014: KM GOT A CHANCE TO FILM A COMMERCIAL FOR THE APP PEEP WITH LONG TIME COLLABORATOR AND FRIEND, PHOEBE DWIGHT. APRIL 2014: KATY-MAY BEGAN WORKING ON SHORT FILM, UNNATURAL REALITY. IT BLURS THE LINE BETWEEN REALITY AND ACTING AS ASHLEY (PLAYED BY KM) SPIRALS OFF INTO A STATE OF MANIC DISILLUSIONMENT. FILMING WILL CONCLUDE IN MID JULY. MARCH 2014: KM MADE THIS VIDEO FOR THE AUSTRALIAN COMMUNITY CREATIVITY CHALLENGE. FEB 2014: KATY-MAY WILL BE RECORDING A RADIO PLAY FOR THE DISTILLED THEATRE COMPANY TITLED "LIFE AND DEATH AND ART AND GIRLS." KATY-MAY IS ECSTATIC TO HAVE BEEN INVITED TO JOIN THE NY NEO FUTURISTS ENSEMBLE. SHE WILL BE WRITING AND PERFORMING IN THEIR SUPER FABULOUS TWICE WEEKLY SHOW, TOO MUCH LIGHT MAKES THE BABY GO BLIND. MORE DETAILS SOON. NOV 2013: KATY-MAY HAS JUST BEEN NOMINATED FOR A BEST ACTRESS AWARD AT THE MIDTOWN INTERNATIONAL THEATRE FESTIVAL FOR "MARILYN'. NOVEMBER 2017: KM will be joining the NY Neo Futurists as they tour Rhode Island. Deets here. OCTOBER 2017: KM will be teaching a Level 2 workshop in Neo-Futurism with the one and only, Meg Bashwiner. Further details here. Sign up while space is still available. AUGUST 2017: KM contributed an installation piece to the World Premier of Chuck Mee's new play, Life by Mee directed by Joey Rizzolo. Watch the video here. 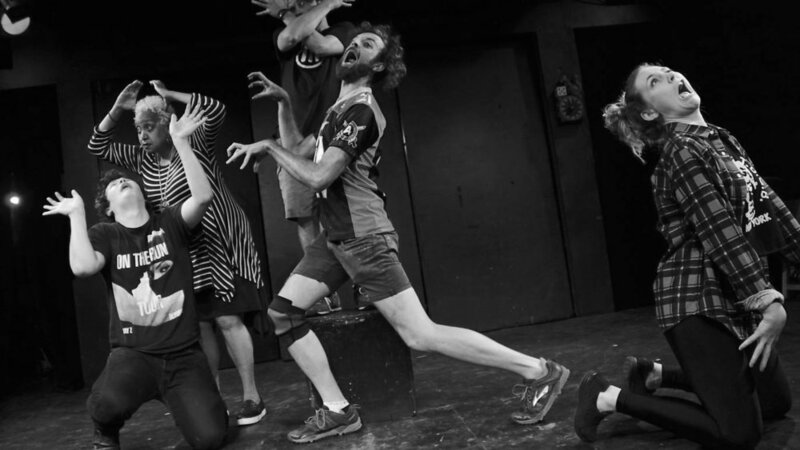 JULY 2017: KM is spending three short weeks with the NY Neo Futurists in their wild, wacky, personal, interactive show The Infinite Wrench. See you there. JUNE 2017: KM is producing the Brooklyn Women's Film Festival. BWFF showcases 26 films in 2 days at Videology, Williamsburg BKLYN. All ticket proceeds go to NY Women in Film & TV. Tickets available here. MARCH 2017: KM worked on short film, Mania. Check out the trailer below. FEB 2017: Back in The Infinite Wrench for three short weeks and working with Jefferey Cranor, veteran Neo-Futurist and co-creator of Welcome to Nightvale for the first time. See you there. JANUARY 2017: Vibe Detector drops on Funny or Die! NOVEMBER 2016: Check out KM for The Confetti Project. JULY 2016: KM has been filming the lead character, White in a feature film upsate called Orgami with Director Woonjae Park. Here is a pic of KM and her love interest Steven Ogg. MAY 2016: KM just wrapped a short she wrote titled, Wine & Nihilism, with longtime friend and collaborator, Vanna Pilgrim. Below is a still with KM as the titualr character, Nihilistic Jess. APRIL 2016: KM has started her own production company, She Said Productions LLC. She will be writing, producing and staring in shorts as well as offering Creative Consulting services to other content creators. FEB 2016: Check out this adorable video, Like A Child. Featuring KM (who also Co-Produced). With special thanks to Daniel Diosdado from Nomada Films. FEB 2016: On set helping out at Pratt Institute for a film noir short. DECEMBER 2015: KM wrote and produced this short, Altered Memory Constructions. Filmed and Directed by Wylie Rush. Check it out here. NOVEMBER 2015: KM coordinated and performed at the NYNF 11th Annual Gala Benefit at the Bowery Hotel on Monday November 16th, 2015, honoring esteemed playwright Chuck Mee. The wine flowed and loads of money was raised to help make art for the coming year. APRIL 2015: KM IS STUDYING IMPROV AT UCB THEATER FOR THE MONTH OF APRIL WITH THIS GOOD LOOKING BUNCH. FINAL SHOW SUNDAY MAY 3RD. MARCH 2015: KM JUST WRAPPED A DORITOS SPEC COMMERCIAL AT UCB.